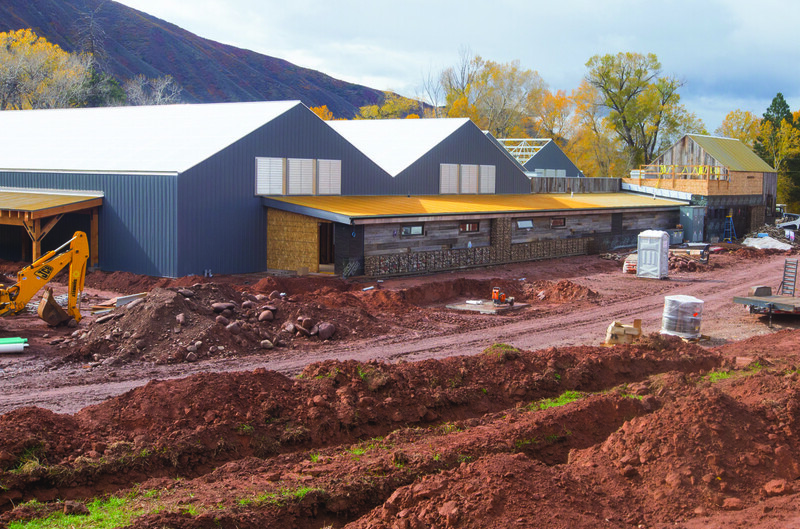 Construction is nearing completion for the new greenhouse, near Basalt, that will supply marijuana to the Silverpeak dispensary. Business owner Jordan Lewis is seeking a new water right in state water court to irrigate up to 3,000 plants at the facility. BASALT — The owner of the Silverpeak marijuana store in Aspen has applied in state water court for water rights to grow 2,000 to 3,000 pot plants in a new greenhouse near Basalt along the Roaring Fork River. The application from High Valley Farms, LLC, which is controlled by Jordan Lewis, the owner of Silverpeak, was filed in Division 5 water court in Glenwood Springs on Aug. 15. High Valley Farms is asking the court for the right to use 2.89 acre-feet, or 941,710 gallons, of water a year. Alan Martellaro, the division engineer in charge of reviewing all water rights applications submitted to Division 5 water court, said Friday that he could not recall another water rights application that specifically said the water would be used to irrigate marijuana plants. He added, though, that the type of crop to be watered by a new irrigation right is not of special concern to his office when reviewing a new water rights application. In its application, High Valley Farms notes that 2,000 plants require 1,000 gallons of water a day and would consume up to 1.14 acre-feet (371,470 gallons) of water a year. And it states that 3,000 plants would require 1,500 gallons day and consume 1.71 acre-feet (557,205 gallons) a year. Lewis said that the new greenhouse includes an “extraordinarily efficient” drip-irrigation system. In 2009, Lewis opened Silverpeak Apothecary on Cooper Avenue in downtown Aspen as a medical marijuana store. In March 2014, the store began selling pot under the Silverpeak brand to anyone older than 21. In August 2013, Lewis gained permission from Pitkin County to build a 25,000-square-foot marijuana greenhouse on a 4.7-acre lot with an existing home next to the Roaring Fork Club in the Holland Hills area. The greenhouse, visible from the highway, is nearing completion. Lewis originally asked the county for the right to build a 37,500-square-foot structure, but the county commissioners granted him only 25,000 square feet for now, which is enough space — at 10 square feet per plant — to grow about 2,000 plants. Rhonda Bazil, the attorney for High Valley Farms who filed the water rights application, told a Pitkin County planner in 2013 that water for the proposed greenhouse would come from the existing domestic well and two irrigation ditches that already provide water to the property — the Alexis Arbaney Ditch and the Kester Ditch. The water rights application from High Valley Farms to the water court seeks the right to expand the existing domestic well to produce up to 2.89 acre-feet of water annually in order to irrigate marijuana plants and for other commercial and domestic purposes. And, via the “HVF Pump and Pipeline,” it seeks the right to pump 0.5 cubic feet per second of water directly from the Roaring Fork River if needed to meet demands. High Valley Farms also seeks the right to store up to 0.26 acre-feet of water (84,721 gallons) in “one or more” underground storage tanks on the property, and the right to “fill and refill” an “operational” water tank that holds 0.10 acre-feet (32,585 gallons) for irrigation, domestic and fire suppression uses. And it seeks the right to ensure its right to use up to 2.89 acre-feet of water annually through an “augmentation and exchange plan,” which would protect it from being called out in dry conditions by senior downstream water rights owners, most likely in Grand Junction on the Colorado River. Instead of having to stop using water, under an augmentation plan, High Valley Farms could substitute its water with water from another source. The source of the augmentation water would either be water owned by the Colorado River District in Wolford Reservoir near Kremmling, or from water owned by the Basalt Water Conservancy District in either the Troy or Edith irrigation ditches, which transport water diverted from the Fryingpan River. In addition to irrigation, water on the High Valley Farms property would be used for “evaporative cooling” in the greenhouse and for commercial uses inside the greenhouse, including three toilets, three bathroom sinks, four hand/utility sinks and a washing machine, according to the application. The water will also continue to be used in the four-bedroom home that was already on the property, which HVF Construction, LLC, also controlled by Lewis, bought from Jesse and Jimmie Caparella for $1.1 million in October 2013. Editor’s note: Reporter Brent Gardner-Smith staffs Aspen Journalism’s Water Desk. He collaborated on this story with the Aspen Daily News, which published it on Monday, Oct. 13, 2014.